Bold Films are onto another surprise contender for multiple awards this year with their new heart-pumping and frightening action thriller NO ESCAPE. Based on a global subject which sits very close to home currently, terrorism, war and asylum seekers, this film provides a serious reality check which keeps you shocked to your core throughout. Jack Dwyer (Owen Wilson) is a water resource engineer who has been relocated with his family to an un-named location close to the border of Vietnam. On a morning stroll to find an American newspaper he gets caught in the middle of a violent battle between armed rebels and riot police. Out for foreigner blood, Jack Dwyer and family face a relentless battle to find refuge and do whatever necessary to keep them alive! Going into NO ESCAPE I could tell that it would be a good film due to the production company it was coming from, however I was not prepared for how intense and memorable this film would be. I have not felt that frightened or physically sick since I watched CAPTAIN PHILLIPS in 2013. Once again, this is a film which addresses real-life tragedies which are simply out of the victims’ control and takes us through their dramatic journey. Many will criticise this film from the off due to the cast which have been used, with most known for their more comical roles than dramatic or even action performances. However, I believe that director John Erick Dowdle (AS ABOVE, SO BELOW) has done this purposely to surprise you and emphasise the reality of this situation, rather than casting the likes of well-known action heroes and heroines. 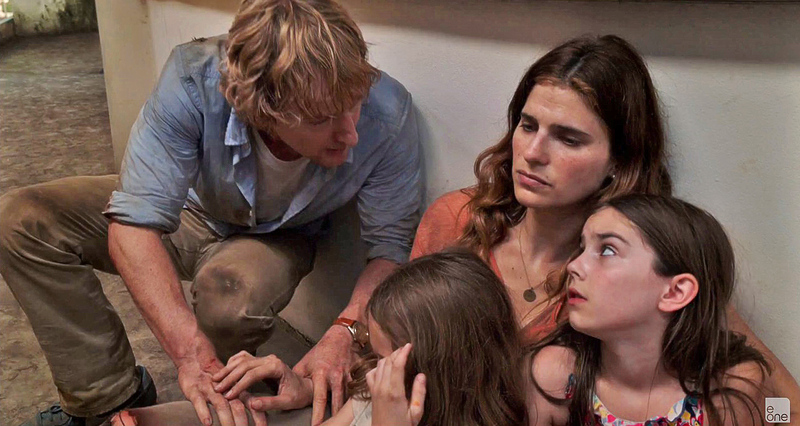 Owen Wilson is superb as the caring and relaxed father and husband who instantly turns into the ruthless protector of his family as the terror begins. Lake Bell is brilliant as the stressed and worried mother Annie, who does whatever she can to keep her children safe, and Pierce Brosnan plays the wonderfully mysterious British “tourist” Hammond, who has a great part in the story. Credit also has to be given to the young actresses Sterling Jerins and Claire Geare who play the scared and confused daughters very realistically. The director has to be applauded for the ways in which he exaggerates the intensity of this situation. By using slow motion shots in dramatic scenes such as the initial rebellion and the roof scene, he heightens the emotions of Jack Dwyer and emphasises just how dramatic yet real these situations are! In addition to this, without spoiling too much, there is a great scene where Owen Wilson’s character is lost for a minute or so and does not know what to do next. As the protector in the film, this is very frightening as his vision and hearing become distorted and suddenly Annie becomes the glue that holds her family together. 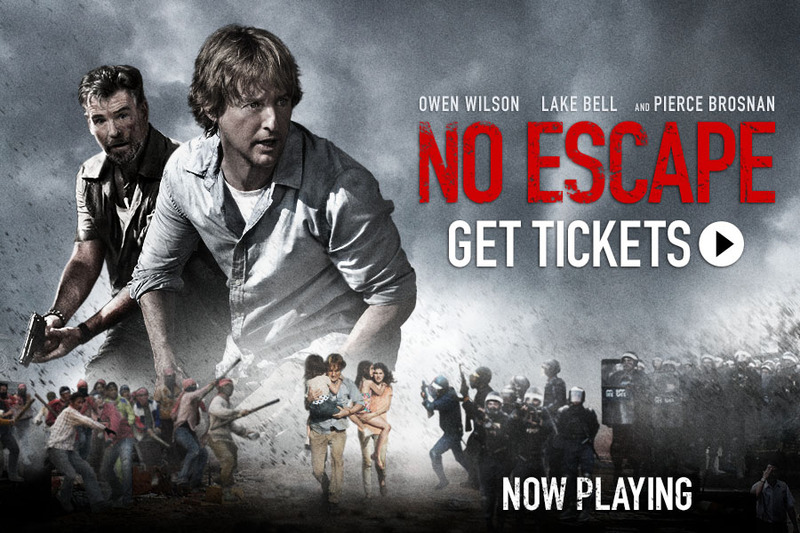 Overall, NO ESCAPE is an adrenaline-fuelled, breath of fresh (but very disturbing) air in the film industry which is used not only to entertain, but also really make its viewers think more deeply about world-wide tragedies which have become a regular occurrence as of late. I can imagine this film completely changing or defining peoples’ attitudes towards the likes of asylum seekers, and rightfully so. This film has so much to praise and very little to criticise. 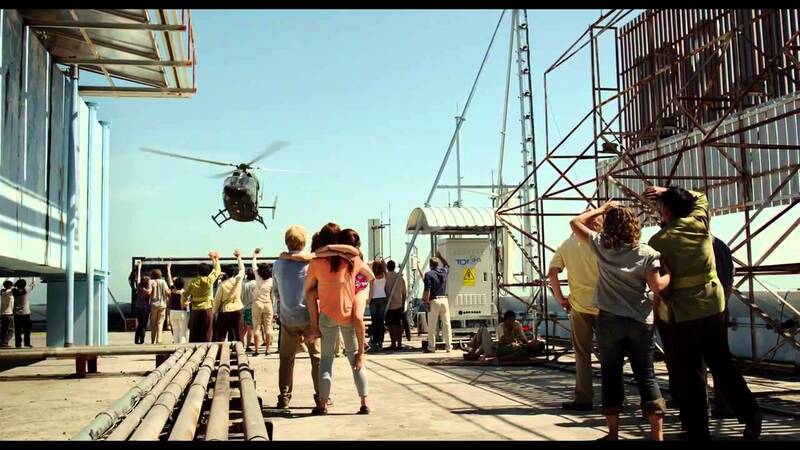 If I had to criticise one thing, it would be that the beginning of the film is fairly slow-moving and not entirely engaging, however I think once again this highlights how realistic the film is as it is representing how quickly a situation like this can change a family’s very plain and basic story into a catastrophic survival tale. Recommendation: A must watch at the cinema this month! Make sure you prepare yourself for a frightening and adrenaline-fuelled experience.